Photo by L. LeRoy Vogler. 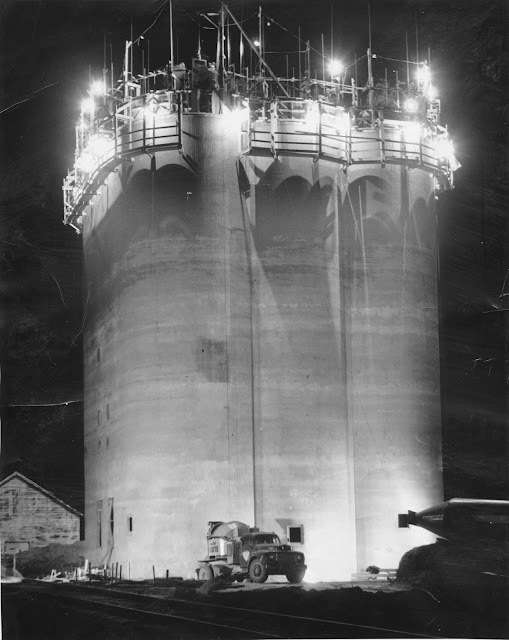 "A night crew pushed ahead on construction of the Odessa Union Warehouse Co.'s elevator at Ephrata. The elevator is rising at the rate of nine inches ah hour, 24 hours a day. The contractor, Larson & Bradshaw, Spokane, is using a slip form which is pushed upward by jack screws to hold the freshly poured concrete."